The antibody is a mouse monoclonal antibody against synthetic peptide of Human Osteoprotegerin. The peptide comprises AA21 to AA39 homologous with Human Osteoprotegerin (N-terminal C has been added to the peptide). SDS PAGE – to determine purity of the antibody. Osteoprotegerin (OPG) or osteoclastogenesis inhibitory factor (OCIF) is a secretory glycoprotein belonging to TNF receptor superfamily. OPG consists of 401 amino acid residues, it has a molecular weight of 60 kDa as a monomer and 120 kDa as a disulfide-linked dimer and is produced in different tissues, e.g. bone, skin, liver, stomach, intestine and lung. Osteoprotegerin inhibits the recruitment, proliferation and activation of osteoclasts. 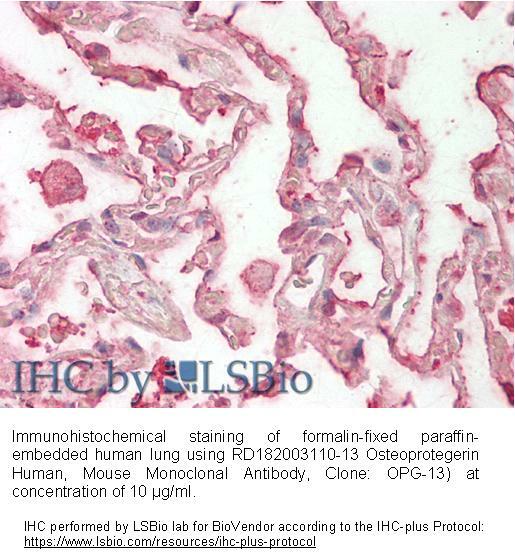 Osteoclast formation activity may be monitored principally by determination of concentration ratio of osteoprotegerin ligand (OPGL)/OPG. Alteration of this ratio may be the cause of bone loss in many imbalances in bone metabolism such as osteoporosis, osteopetrosis, hypercalcemia, metastatic osteolytic lesions and rheumatic bone degradation.